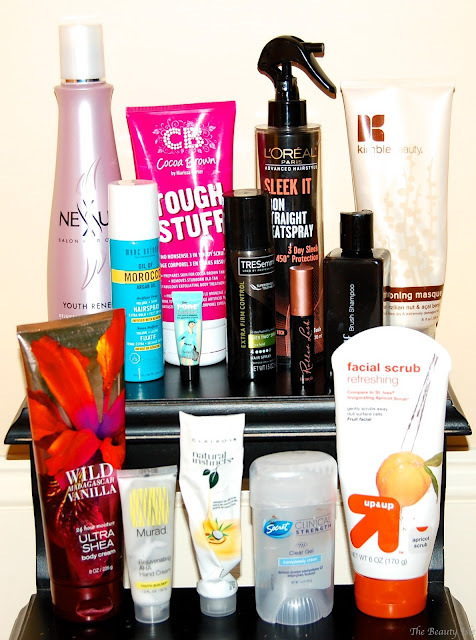 Here are all the beauty products I used up in the month of July and my thoughts on each. This was a really good conditioner. It made my hair feel soft and conditioned. I really loved the scent, it almost smells flowery yet kind of like baked goods, I'm so bad at describing scents! I already have a backup of this. I didn't really notice much of a difference in my hair when I used this. It's supposed to protect my hair from heat but how do you really know if that's true? I wouldn't repurchase. I do have another one of these but in the Blow Out Spray spray version. We'll see if that's any better. This was an extremely thick conditioning hair mask. It made my hair really soft and shiny. You can read my full review here. This conditioner was from a box color. I have yet to find a conditioner that's better than the little tubes from a box color. These were both fine hairsprays, nothing special. I still prefer my Frizz-Ease hairspray. This is a very intense body scrub. It's definitely not for those with sensitive skin. I would repurchase this. You can read my full review here. Bath & Body Works body creams are super thick and great for dry skin. This one smells like delicious baked vanilla. This isn't the thickest hand cream but I still love it because it has glycolic acid which is will improve the clarity and texture of the skin on my hands. You can rad my full review here. I kept this scrub in the shower and used it in the morning. I think this Target brand is just as good as the St. Ives brand. There was nothing special about this makeup brush cleanser. I think any hair shampoo or face cleanser would work just as well. This is a great primer. It really makes my foundation last longer and go on smooth. I already have 2 more samples sizes of this. I really loved this mascara. It gives my lashes a nice fluttery volumized effect. I'd repurchase but I have a million other mascaras in my stash already.